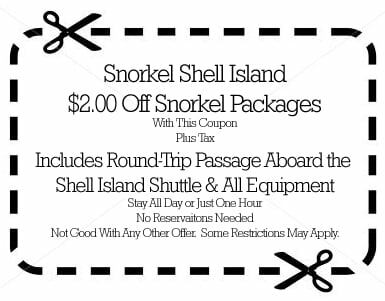 Check this page often for Panama City Beach Coupons for Shell Island Shuttle along with other discount offers. 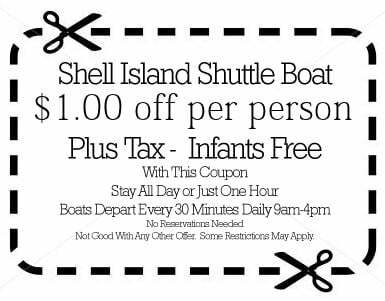 Would you like to know the easiest and fastest way to go to Shell Island, where you can stay for as little as an hour or as long as a day? While on Shell Island you can do everything you normally do at the beach with one big difference – no big condos behind you just you and nature! This section of the island is owned by St. Andrew’s State Park and is as close to nature as possible with pristine white sand stretching as far as the eye can see! Sea oats cover the dunes and turtle nest sites are protected! You can keep all the shells you find that do not have inhabitants! Make sure to bring all your necessities, etc. (but not too many) and help be a good steward by bringing all your trash back to the boat.